Vega Sicilia is Spain’s most famous wine Estate and their Unico Reserva Especial the most critically acclaimed. As such we are delighted to offer the new release of Vega Sicilia Unico Reserva Especial 2015, a stunning blend of some of the greatest recent vintages of Vega Unico, the 1994, 1996 and 2000. When Robert Parker tasted the 1994 in June 2005 he scored it 98 points and stated, ‘the 1994 Unico may be the greatest vintage released since their legendary 1970 and 1968.’ When Parker’s Spanish expert Jay Miller tasted the 1996 Unico he scored it 97 points stating, ‘The 1996 Unico is from what the Vega Sicilia team calls an icon vintage.’ The youngest vintage of Unico included in the blend is the 98 point scoring 2000, which even in its relative youth Miller says displays, ‘Aromas of Asian spices, lavender, incense, truffle, and confiture of black fruits…Sweet, forward, rich, and hedonistic’. The 2014 vintage of Vega Especial was a blend of 1994, 1995 and 2000. Last year we released it unscored, as we are with the 2015 today. We posited that on the strength of the vintage blends it would receive a stellar score. In August it was awarded 98 points, since then it has become very hard to buy and has risen in price. The 1996 vintage in Ribera del Duero was very fine indeed and the inclusion of the 1996 vintage over the 1995 suggests an even better wine and score when Parker’s current Spanish correspondent Luis Gutierrez tastes this summer. Unico Reserva Especial is extremely rare and hard to source, its production is less than 1/6th of Unico, only 1,000 cases a year. As such it rises in price quickly, as can be seen from the table below. Vega Especial is born out of a wonderful Spanish tradition. 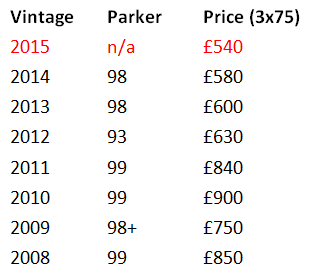 Historically very few estates ever bottled their own wine, instead selling in cask. As a result they would sell two wines, a vintage wine made from that year alone and another wine without a specific harvest which was called Reserva Especial. The Reserva Especial is Vega Sicilia’s most spectacular wine, a blend of three vintages, thereby embracing Spanish ageing tradition and their foremost grape variety, Tempranillo (80%) combined with Cabernet Sauvignon (20%). It is made from their oldest vines, often 100 years old, and blends three vintages. They are designed to be more than the sum of their parts and selected for their individual characteristics to achieve balance. The vintage name is taken from the year of its release when the estate feels each wine is ready. In the absence of a 2001 Unico, Vega Sicilia has re-released the 2000 Unico which I reviewed in Issue 189. The 2000 Unico is deep crimson-colored with an ethereal perfume aided by its extended upbringing. Aromas of Asian spices, lavender, incense, truffle, and confiture of black fruits are compelling. Sweet, forward, rich, and hedonistic, it nevertheless has the balance and structure to continue evolving for another 5-10 years. In strong vintages Vega Sicilia drinks well at age 50 and I would expect the same of the 2000. The 1996 Unico is from what the Vega Sicilia team calls “?an icon vintage”. Medium purple in color, it emits a lovely perfume of smoke, mineral, Asian spices, balsamic, and assorted black fruits. Elegant, savory, and intense on the palate, it has enough underlying structure to evolve for another decade and drink well through 2036. The 1994 Unico is also the product of an esteemed vintage. It has a bit more power and concentration than the 1996 but a similar elegant personality.